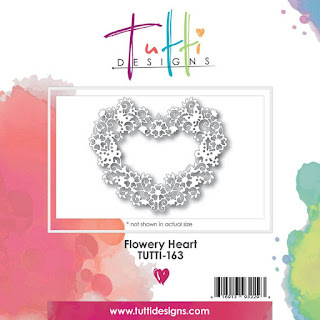 Tutti Designs: Flower Heart. Beautiful Couple. Hello and welcome to Tutti Designs. Pam here today with Wednesdays card..
Another beautiful die from the August Release.. Available now. Finished card size 8" x 7" Oyster pearl with soft Lilac colour. This is a technique I love doing with floral hearts! Cut the design once in with card adhere to a plain heart if you have one. Next cut the floral heart in soft lilac.. Matching up the pattern adhere to the white heart by Top & Bottom Center flowers only! so the heart stands up at the sides. I have stamped in the center with lilac ink "To A beautiful Couple. Hope you like this Celebration card. Pam x. Here are some useful like for you. Thank you for stopping by will be back next Wednesday. Pam Simpson For Tutti Designs. Labels: Flower Heart. Beautiful Couple. Morning Pam, This card is so pretty, the heart die-cuts looks so feminine, I love this card. Absolutely GORGEOUS Pam! Love the color you chose to showcase this beautiful die and your design is so elegant. Wonderful inspiration ... thanks! Love the soft blue and great idea of cutting out the white heart to be back of the blue heart. I had to do this on my second card but love your idea of cutting a heart behind he die cuts. Beautiful card. Evening Pam WOW what a stunning card and I love the die you have used it's perfect in the colour you have used. Summery Wreath from Tutti Designs. A Yellow Rose with Tutti Rose Duo Frame. Birds in a Tree . . .
Have Faith . . .